What does victory of Orban in Hungary mean for the EU? The convincing victory of Viktor Orban in the parliamentary elections in Hungary plunged the neo-liberal Europe into turmoil. In the main Western European media this victory is presented as "unexpected" and even "unnatural", but the facts say the opposite. 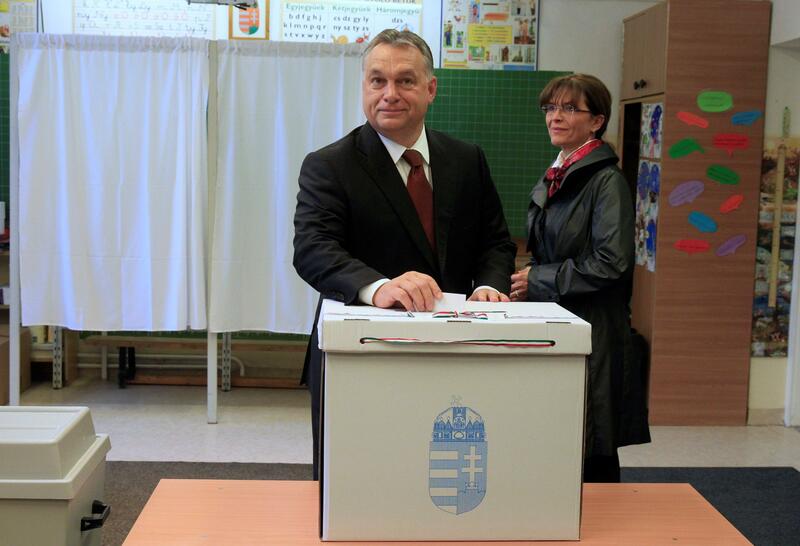 Never in the past 15 years democratic elections in Hungary have been held at such a high voter turnout (about 70%). The right-nationalist coalition (the Fidesz Party and the Christian Democratic People's Party) received 48.5% of the vote, which provides it with the necessary majority of two-thirds of the seats (133 out of 199). According to the Hungarian government, this is a kind of record, as Fidesz became the first party in the post-communist history of Hungary, which was able to win elections three times in a row. On the second place - the right-wing radical party Jobbik, which gained about 20% of the vote. This is considered an unfortunate result for Jobbik, but in the aggregate, the right and nationalist parties of Hungary received in the last elections almost 70% of the vote, which is a very serious indicator of sentiment not only for Hungary, but for the whole Central Europe. We see a defeat of the liberal pro-European opposition in Hungary (socialists - 12.3%, "green" - 5.55%). This suggests that the pro-European liberal opposition is becoming a marginal force that retains the electoral base only in certain areas of large cities, primarily in Budapest. The marginalization of liberals and "progressives," observers say, is manifested as a trend everywhere - including in countries of Western Europe and Russia. At the same time, the number of supporters of the "national revival" is growing. This trend fundamentally contradicts the ultra-liberal ideology of Brussels, which regards the peoples and states of Europe as only a material for building a supranational European empire. Now, according to analysts, for the European Commission it will be extremely difficult to implement penal measures against the government of Orban, since such wide support of voters gives him a large margin of safety for the coming years. A new round of exacerbations between Budapest and Brussels may begin in the coming weeks, as the government of Orban intends to close non-governmental organizations that interfere in politics, primarily those financed by George Soros. The first blow is expected to be directed at the "forge of liberal cadres" - the Central European University, which was founded by Soros back in the early 90s. It is very likely that the authorities will continue to restrict the activities of mass media owned by billionaire Lajos Simiska, a former ally of Orban, who took the side of his political opponents. The European Union and the OSCE in this regard have already criticized the "significant reduction in pluralism" in the Hungarian press. Orban has built his election campaign on the fight against illegal migration, which, in his view, is the main factor of instability in Hungary and Europe. He did not hesitate to adopt the conspiracy theories, which only right-wing radicals have used so far. According to these theories, Brussels and the UN set the task of replacing the indigenous population of Central Europe with migrants from the Middle East and Africa to create a new "multicultural" community, reminiscent of the social construct created in the Soviet Union called the "Soviet people". Even ideological opponents recognize that Orban is a talented politician who has "straddled" a topic that has become the main thing in European politics of recent years. And so, despite allegations of corruption and poor management, people vote for him, as he will be able to protect them from external (migrants and Brussels) and internal (Gypsy) threats. In favor of Orban played the fact that the Hungarian economy has shown good results in recent years, which is confirmed by German investors who evaluated the promising Hungarian market. It should be acknowledged that the EU and the leaders of Western Europe do not do enough to dispel Orban's accusations, rather the opposite. In the German government, the liberal wing, headed by Angela Merkel, is still trying to push the idea that "Islam belongs to Germany," and also to impose plans for the reunification of migrant families, which may lead to another massive influx of refugees from countries in Asia and Africa. The Bavarian Christian Social Union, also part of the ruling coalition, sharply opposes this. This suggests that an anti-immigrant conservative bloc is being formed in Central Europe, including Bavaria, Austria, Hungary, the Czech Republic, Slovakia and Poland. However, Orban's victory is welcomed not only in Central Europe; it has already been congratulated by the main right populist parties of the founding countries of the European Union. The leader of the French National Front, Marine le Pen, said that the Hungarians once again rejected the neoliberal values of Brussels and the mass immigration encouraged by it. This means that the national forces of Europe can win the next elections to the European Parliament in 2019. Members of the "Alternatives for Germany", representatives of the right-wing parties of Italy and the Netherlands expressed their solidarity with Orban. The overwhelming majority of ordinary readers of the German-language press evaluate the victory of Orban positively. Most often there are the following statements: "The victory of Orban is a slap in the face of Merkel and the European Union"; "The people of Hungary said their word, and it's good"; "The victory of Orban is a blow to the plans of Macron and Merkel, but above all on the migration policy of the German government"; "The EU has expanded to the East under pressure from the United States and Great Britain, and now it has received a" decent response "; " If 70% of voters vote for right-wing and nationalist parties in the country, then this is not a trend, but a fact. " According to most European observers, Orban's confrontation with the European Union will be increasingly fierce. The Hungarian Prime Minister is seeking to reform the EU, with weak regulatory and political functions. Practically, the European Union should return to its original role - the common market. In promoting this concept Viktor Orban counts on the support of all the national conservative forces in Europe. Naturally, Brussels will not agree to any weakening of its powers.